Many homeowners make the costly mistake of thinking roof replacement is the only option to rid their home of any ugly, stained roof. 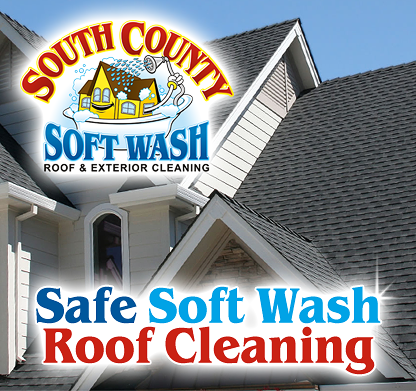 Let us put our Soft Wash Roof Cleaning service to work for you and your home. We'll make your existing roof look like new for a fraction of roof replacement cost! What's Eating Your Roof? Is Your Roof Covered In Black Streaks? That isn't dirt on your roof - it's actually bacteria, algae and mold taking root on your home! It's true, your roof actually isn’t dirty at all - but it is under attack! It's under attack from organisms like bacteria, algae, mold, and mildew that spread across your roof shingles and negatively impact your home’s beauty and property value. These organisms not only look awful, but they are also eating the limestone in your shingles, causing your roof to prematurely deteriorate and retain heat. Simply put, a black stained and streaked roof is costing you your hard earned money! We use a proven safe & effective Soft WashRoof Cleaning method because standard pressure washing only attacks the stains at the surface. Pressure washing may remove the stains, but the roots remain, allowing the growth of bacteria, algae, mold and mildew to return all too easily. 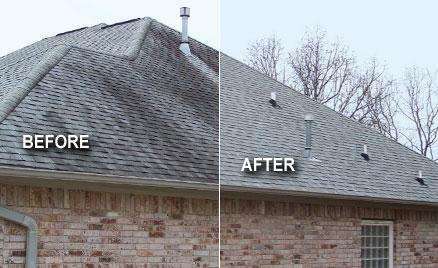 Our Soft WashRoof Cleaning method completely eliminates these unsightly organisms at their source - meaning you can enjoy new looking roof for a longer period of time! 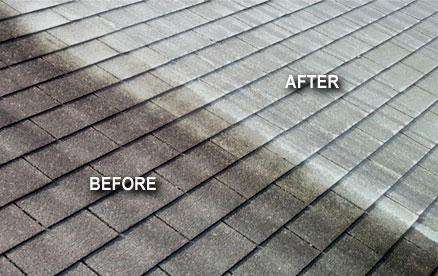 Pressure washing should NEVER be used to clean your roof! Many homeowners in the Rhode Island area have found out the hard way that standard pressure washing and roof shingles do not mix! The resulting shingle damage and water forced under their roof decking required expensive repairs to fix. This is another important reason you should only have our Soft Wash method used to remove those unisghtly roof stains - Soft Washing poses zero risk of damage to your roof!